If you already have a Weibo account and use the iPhone app, converting to English is easy: just click on the “More” icon (更多) in the lower right corner of the app, then click on the “Settings” icon ! (设置) just at the top; then click on the “Language” icon (多语言环境) in the middle; hit “English” and you’re done! Step 2: registering a new account. You can choose to get a confirmation via mobile phone or by email, but I think email is easiest. If your Chinese is nonexistent, I strongly recommend you use Google’s Chrome browser both now and whenever you visit any Chinese website. The main reason is one of their awesome features; you can instantly translate any webpage with a click of the button. See the image below for the example on Weibo: click on “Translate” at top and the page becomes passable English. By the way, if you click and it says “error”, keep clicking! It works almost 100% of the time. OK, now we can see the instructions in English, as seen in the next image. Just follow the image below; the trickiest part is picking a strong password and a cool Weibo screen name. 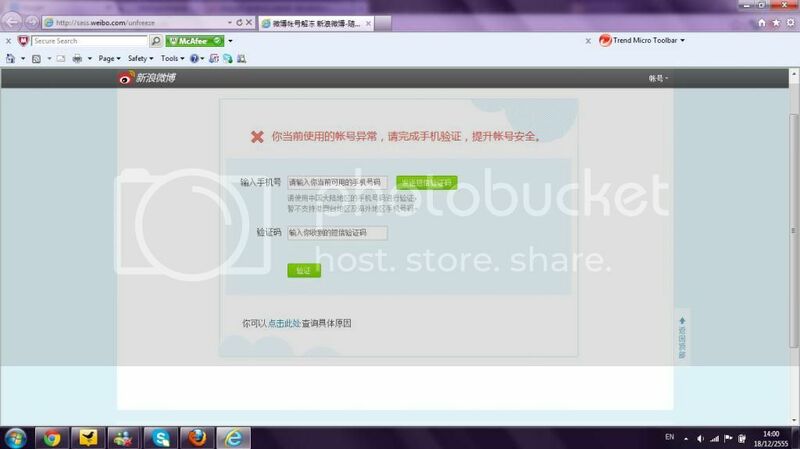 Once you are done, hit enter, follow the confirmation instructions in your email or mobile, and you’re now on Weibo! Step 3: Download the Weibo app to your device. This part is easy for anyone who has an iPhone/iPod Touch/iPad. Just go to your app store, search for “Weibo” and download the official app from Sina (it’s probably listed in Chinese; their official app download page is here). When you open it for the first time, you have to enter your email address (the top field) and then your password (the second field), and then hit the left button. Then you follow the instructions above under “if you already have a Weibo account” to switch the app to English. Step 4: Become my fan! You can find my account at weibo.com/daniudaifu. My Weibo screen name is “全科医生圣西睿智Richard”. No, it’s not a very catchy screen name but it gets to the point; in Chinese it means “Doctor Richard Saint Cyr”. I usually update my Weibo a couple times a day with health tips and public health alerts. I usually write in English but am also trying to type more Chinese. You can see my Weibo account here; you can also scroll through my latest Weibo posts here on this website, along the right side of this screen. Previous PostYogurt Helps You Lose Weight! So Says New Lifestyle StudyNext PostYogurt Is Healthy — But Which Is Safest To Eat in Beijing? Thanks, this was so useful. They don’t allow anyone to sign up who isn’t Chinese registered with their passport I.d. You can enter any number in the passport field and it should accept it. I was able to sign up through the iPad app. Thanks Dr. Richard for the change to english tips. The icon position had changed and the naming of the buttons was slightly different than you describe, but I found the Language setting no problem. Sina Weibo really is so much more than Twitter! Congrats on signing up… Weibo probably will now get even more popular internationally since Apple is now including Weibo as a default application. I signed up several days ago. I didn’t need to put in any passport information. I just chose the option to use my email address. As long as you don’t have capital letters in your email address you should be fine. If you’re having trouble reading anything. You should try using a browser that has a translator add on option. impossible to register for abroad people. how could i solve? I registered as a foreigner no problem, so sorry I’m not sure what problem you’re having. I certainly didn’t have to prove any ID with a copy to anyone. I’ve registered weibo 2 days ago and got account. Everything seems to be fine until I cannot log in today. The website has shown that my account have a problem and require me to put telephone number for security. The bad news is I register via e-mail so I don’t have any phone number. I’m sorry, I’m not sure how to help you, as I cannot read the Chinese either. I signed up 3 years ago. I think I did need to confirm with a mobile phone number… Subject: [myhealthbeijing] Re: Hey Laowai: Now You Can Use Weibo In English. Here’ s How.